There are a number of remarkable things about the upcoming Tom Cruise vehicle (and live-action Wall-E remake) Oblivion, not least the fact that somebody has given the director of Tron: Legacy another $130 million to play with. But perhaps most extraordinary is the film’s subtle marketing campaign, favouring elegant, understated images like this one over louder, Tom Cruisier options. The simple, intriguing title treatment above is the perfect distillation of that restrained approach. Set to premiere at Sundance next month, Upstream Color is writer-director Shane Carruth’s first film since his mega-low-budget sci-fi hit Primer, which won the indie festival’s Grand Prize back in 2004. Clearly unworried about the crossover potential of his follow-up, Carruth has elected to refer to the film’s title in marketing materials by its initials alone. This might seem short-sighted, but he’ll be laughing when the time comes to design the film’s Twitter icon, as I can personally attest. The whole Watch The Throne vibe of Baz Luhrmann’s long-awaited Great Gatsby adaptation is well-represented in this brassy art deco rendering of the film’s title. And as attempts to hide extraneous words in a movie title go, the sandwiching of ‘The Great’ into the G of ‘Gatsby’ is a fucksight more logical than the direction taken recently by the marketing team of Silver Linings (whisper it) Playbook. There were plenty of things lacking from Ruben Fleischer’s 2009 sleeper hit Zombieland, but style was not one of them. 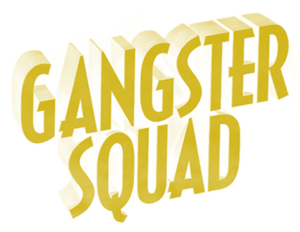 From the looks of its bombastic marketing campaign, his third film Gangster Squad will be similarly replete with panache. The striking depth of this title treatment (and its bonkers looking-down-on-the-logo-from-the-upper-left perspective) suggests a film that wants you to know it’s arrived. Most pundits agree that the real reason Skyfall has grossed nearly a billion dollars at the worldwide box office is its use of variable character alignments in its title treatment. In which case Park Chan-wook, set to release his firsr English-language film Stoker early next year, can go ahead and start work on that swimming pool he’s always wanted.